Tomorrow is Cyber Monday. Lots of people shopping on line and lots of hackers out there too. Be safe. 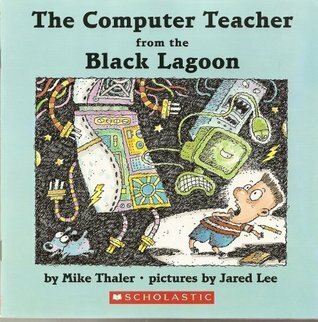 This first book shows kids a lot of things that can happen if they don’t know what they’re doing on the computer. Read and laugh at the misconceptions one boy has about computers. The boy in this book is worried about taking a computer class at school. He’s heard a lot of scary things about the teacher, Miss Pluggins, and the lab with one-eyed monitors that stare at you all day. He’s afraid of her dog, Browser, who won’t let you escape. He’s heard terrible things about a Weird Wild Web where a giant wild spider lives. He thinks he has to learn how to surf on a mouse and find out how many bites are in the computer. He’s also terrified of the spell hex and cursor that can turn you into a frog, and the pixels which tie you up to a log and ram information into your head. He’s petrified of the Hacker and the Blog, and he’s convinced he might catch a virus. In the end, he and his friends march into the dangerous computer lab and meet a perfectly nice teacher who tells them they’re all going to be able to access all the information in the world, make their own cards, write their own books, and play computer games. Now that doesn’t sound terrifying at all! Ironically, the second book was published in 1999, during the Y2K scare of 1999/2000 when people were convinced that all the world’s computer would crash on 12-31-99 at 12:01am. 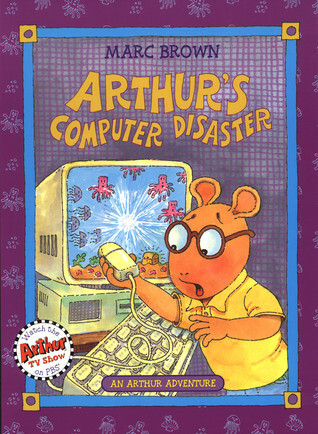 Read to find out what happens when Arthur plays with his mother’s computer and the keyboard crashes to the floor. Arthur’s mother was working on her taxes and specifically instructed Arthur not to play on her computer. But Arthur and his friend Buster had other ideas. They played ‘Deep Dark Sea’ on mom’s computer until they knocked the keyboard to the floor and the screen went blank. Arthur tries reading the manual, but he doesn’t help. They ask their friend, Brain, but he doesn’t know what to do either. They go to the computer store for advice, but can’t afford the price. Nothing they do can fix the computer and Arthur has to admit to his mother that he had been playing games on her computer. His mother was able to fix the computer by jiggling the switch, but Arthur was grounded from the computer for a whole week. In the end, Arthur’s mom gets hooked on the game too and forgets to check in on the kids when they go to bed. So, Arthur and DW tuck themselves in for the night.